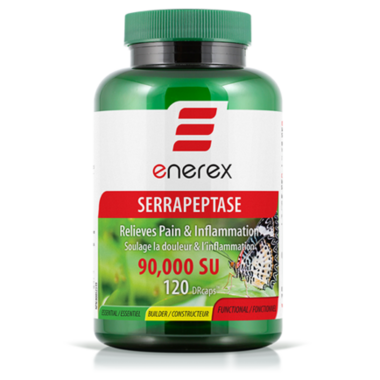 Enerex Botanicals Serrapeptase is a natural enzyme that effectively reduces pain, inflammation, as well as mucous build-up. Whether symptoms stem from injury, surgery, or disease such as arthritis or sinusitis, its action disrupts pain pathways and restores your body’s persistent inflammatory response to reduce swelling and improve circulation. This productive and efficient “miracle” enzyme can easily bring comfort and relief for better health. Directions: Adults: Take one capsule on an empty stomach 30 minutes before or 2 hours after eating with a glass of water or as advised by a health care practitioner. Non-Medicinal Ingredients: Organic brown rice flour*, magnesium stearate, gellan gum, hypromellose (vegetarian cellulose complex DRcaps = Delayed Release capsule). There are no other ingredients added to this formula.